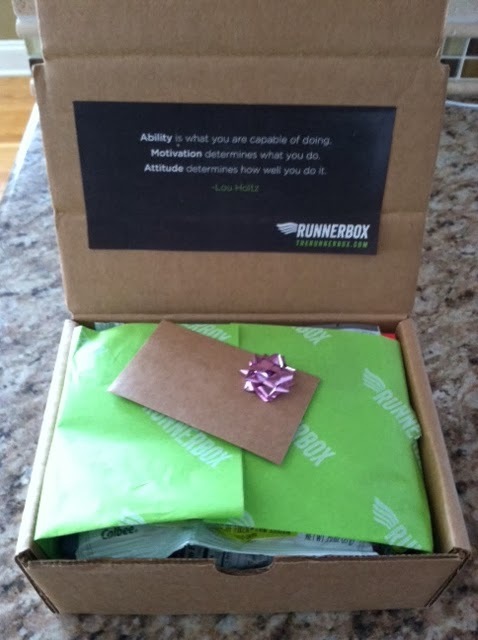 Pamommy Loves to Run: RunnerBox Giftbox review and Giveaway!!! My favorite box service showed up on my doorstep about a week ago and do I LOVE this stuff. 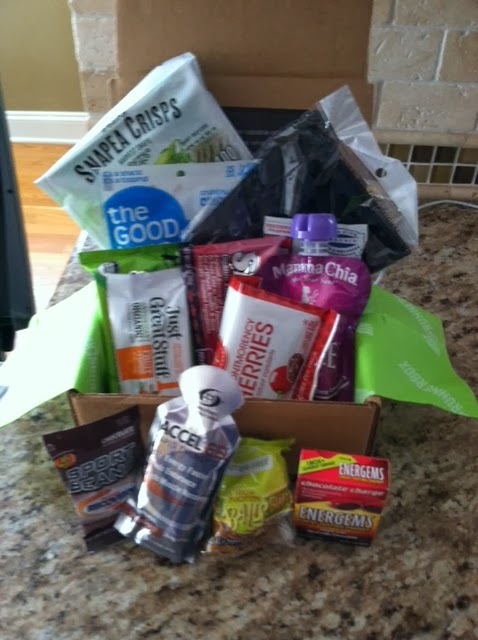 I was lucky enough to receive the RunnerBox GiftBox for review and once again, Runner Box did not let me down!! The Good Beans: Chick Peas flavored with sea salt, always a hit in my household. Snap Pea Crisps: My kids got a hold of these and ate them all some I'm guessing they were pretty tasty!! Protein Recovery Sports Beans: Made by Jelly Belly, chocolate flavored and actually quite tasty. Sharkies Organic Energy Chews: A natural source of electrolytes, gluten free and wheat free. I have yet to try these but got two different favors, watermelon scream and citrus squeeze. Looking forward to trying them this coming long run! Accel Gel Rapid Energy Gel: Love these! Got all natural chocolate in this box, loved it! Just Great Stuff Antioxidant Organic Bar: These are gluten free, vegan and contain 11 servings of spinach, dates and carrots. Sorry, not my favorite bar but not as bad as some I've tried. Energems: Great tasting energy dietary supplements that are made with milk chocolate. I have yet to try these either but they look tasty and will come in handy when I need another pick me up. Runner Box head wrap: I LOVE this. It can be a head band, neck wrap,wrist band, anything my little heart desires. There were a few other fun things in the box but I picked out my favorites. This box service is every other month rather than monthly which works better for me and gives me plenty of time to get through all my goodies. Check them out at Runner Box or on Facebook. Does anyone else love Runner Box as much as I do?? Any other box services you can't live without? Now for the good stuff. Runner Box has offered a Giftbox for my readers. Follow the rafflecopter for your entries. It's definitely one of my favorites. Everything I get in the boxes are always spot on for me. I've never tried RunnerBox but I'd love to! Good luck, you'll love it if you try it and they are every other month so not too overwhelming. I tried RunnerBox and loved it, but can't justify getting myself the monthly membership. This one's every other month! I have not tried Runnerbox,but I have tried Nature box or something,its a snack one. There are so many different ones! There are tons to try, I've tried a few and still love this one! I've never tried Stride Box, looks good though. I really want to try Runner Box! I'm going to be moving in a few months but after that I will probably check it out! I've never tried Runner Box - but it looks great. I love Runner Box! I also like Bestowed, Love with Food and Yumvelope. I am a bit addicted to my healthy boxes! It's like a welcome monthly gift! I got a single Runner Box as a Christmas present and liked it. I've also tried Nature Box and Bulu Box, but didn't like them as much. Ditto. I seem to get more out of the runner box, it's just more ME. I haven't tried Runner Box yet. I have tried Bulu, Bestowed, Nature Box, and Stridebox. It's definitely worth a try. I love the boxes I've gotten! I've tried Stride Box and Bulu Box but never runner box! I'm intrigued! Try it, try it, try it!!! I've tried stridebox but would love to try this one! Go check them out and get one for yourself! I have never heard of Runner Box. I am definitely going to try it! I've never tried Runner Box, but I've heard great things! I haven't tried it, but it looks awesome! Thank you for the giveaway! 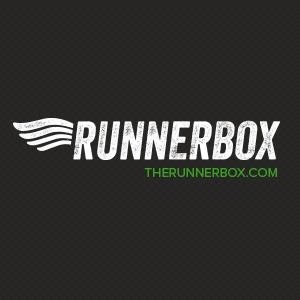 I've never tried runnerbox, but it's a great concept! I haven't tried one, but I so want to! I haven't tried any of these subscription box services yet. They seem more like great gifts than something I'd purchase myself. I would love to try Runner Box! I've been interested in trying a box subscription but haven't tried any of them yet. I haven't try runner box yet but I'm planning on it. I just cancel one of my box (PopSugar) so I'm looking for one that's good to be subscribe too. I haven't tried runnerbox before. I have tried Klutchbox and Kona Kase before. I've never had RunnerBox but did get Nature Box as a gift last year. It's worth it! Check them out and let them know I sent you! Always wanted to try RunnerBox! I have never tried a runner box. Not yet but I'd love to! I've never tried Runner Box or anything like it. I'd like to though. I haven't tried Runnerbox, but I do use Graze Box.